to increase community preparedness for the challenges and opportunities of the energy crisis. Through this event the group plans to inform citizens about options for preparing for near-term disruptions and to encourage participating in the strategic planning process for achieving long-term community self-reliance in energy, food and economy. On Friday evening January 13th, a number of films will be shown at various locations in Boulder including The End of Suburbia and Powerdown: Options and Actions for a Post Carbon World, a new video dvd based on Richard Heinberg's book of the same name. See here for more details. Saturday January 14th will be an all day event hosted at the UMC Glenn Miller Ballroom (the student union) at The University of Colorado at Boulder. Here are the links for Julian Darley's Global Public Media and Post Carbon Institute. 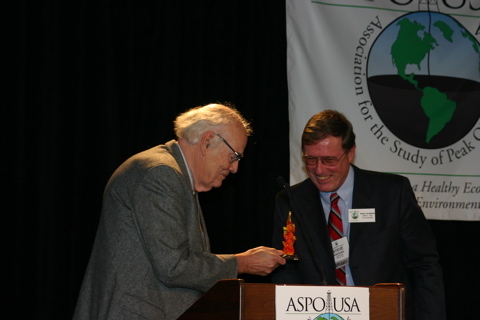 This is your chance to hear Al Bartlett ("what is an exponential function") who received one of the first M. King Hubbert Awards at ASPO-USA (from co-founder Steve Andrews, picture below courtesy of Stuart). You can also see a complete version of Megan Quinn's film about Cuba. Excerpts from this film were well-received by viewers at ASPO-USA. Contact information can be found in the press release or at the Boulder Valley Relocalization website (linked in at the top). I'll be there and I always like to meet fellow TOD contributors in person. So if you're in the Rocky Mountain area or just traveling through, I hope you can make it! Flying, assuming you are in a jetliner is about twice as fuel-efficient as driving per-passenger-mile, so you'd be doing us a favor. Perhaps those who go could recruit some folks for a second TOD Local Site out West? As a Boulder resident (and native), I'm glad to see this in my city! It comes at an interesting time, at least for area. For decades the Denver metro area has been sprawling in a way that makes Los Angeles look good. Vast fields of "ranchettes" are appearing all the way from Fort Collins to Colorado Springs. Boulder has, since the late 60s, been an exception by limiting urban expansion, creating greenbelts, and increasing density population steadily over time. A few years ago, Colorado voted down an Oregon-style law to curtail urban sprawl after a massive lobbying effort by the profoundly unsustainable development industry. We're now continuing to suffer the consequences of that vote. In and around Boulder, there seems to be growing interest in peak oil. At the local Boulder Bookstore, the "recommendations" section had a shelf full of titles on the topic. Still, most of the time, most people haven't heard of peak oil and you see as many SUVs as bicycles around here. I think it a telling statistic that 23% of the workers in Boulder County are government workers compared to 18% nationally (and that includes military.) Also Boulder government employment has been growing at almost twice the rate of local private employment the last two quarters of 2005. Bottom line is Boulder can not become "localized" so long as its government employment is higher than the national average. Well, the major employers are the university, some high tech companies, and federal research agencies (NIST, etc) -- I'm not entirely sure I follow your reasoning. The federal employment is mostly academic. The Boulder economy is dependent on outside resource importation to support in the manner to which it wishes to become accustomed. Given that those imports are governmental, the Boulder economy is freer of efficiency and productivity constraints than free market economies. In other words, Boulder would have increasing trouble in EARNING its keep in a free market. Since they increasingly depend on government, they can afford to waste resources on inefficient transport and energy production schemes. The Boulder economy needs only to be politically correct rather than competitively efficient. That is a fair analysis, Whitehall, it would serve Boulder well to become more localised and self sufficient in its employment, food production, wealth production, energy generation etc. Hopefully this conference will help begin that process. But what think you when you extrapolate your criticism to the US as a whole?